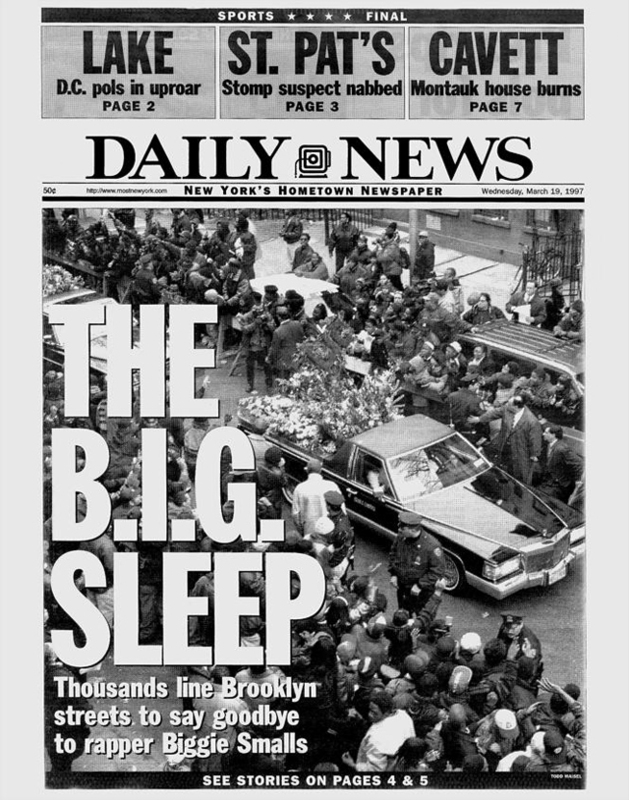 Now 20 years old, this is the front page of the New York Daily News on Wednesday, March 19, 1997; a day after the funeral of Biggie Smalls. B.I.G. was carried through Brooklyn as thousands of his fans gathered near his old home in Bed-Stuy to pay respect and say goodbye. The funeral was held at Frank E. Campbell Funeral Chapel in Manhattan; Faith sang 'Walk With Me, Lord' and Puff gave the eulogy. The hearse then brought his body to where I was raised in Middle Village, Queens - he was cremated at Fresh Pond Crematory, where my uncle, several friends, and many celebs have also been cremated. It's a small spot in a neighborhood known to outsiders for its cemeteries and being the final resting place for the Mob. BIG was killed by a single bullet that pierced several vital organs in a 1997 drive-by shooting in Los Angeles. He was struck four times, but the fatal bullet hit his lungs, heart, and colon. He died on 3/9/97 & to this day, no arrests have ever been made. Daily News. Labels: Daily News, Nostalgia, R.I.P., The Notorious B.I.G.